So, this is the compilation of the funniest VR reactions in 2016. If you fail at no. 8 (that’s where I failed), you got 7, if you fail at no. 4, you got 3, et cetera. Share your score on the comment box below! 1. That moment when your grandma played a horror game on PSVR. The first encounter at 0:15, though. So close to laughing. 2. That moment when your granny ride a virtual roller coaster. The way she screamed, though. 3. Lesson learned: Don’t let your grandfather tried VR out. You didn’t laugh, did you? I tell you: Be careful at 7:08. You’re welcome. 6. When you’re too scared, but you can’t take the VR headset off. If you want prank your friend with a virtual app called Sisters, you can get it free on Android and on App Store. Find out here. 7. This one should be easy. Probably the easiest level, right? 8. And, this one is too hard. It’s her reaction and the people laughing around COMBINED! Failed here. 10. This granny has the cutest scream ever. 11. Remember, don’t even smile. 12. When your grandmother is visiting Jurassic Park. 13. Is she killed or what? 14. When Resident Evil 7 is coming to Virtual Reality. 15. 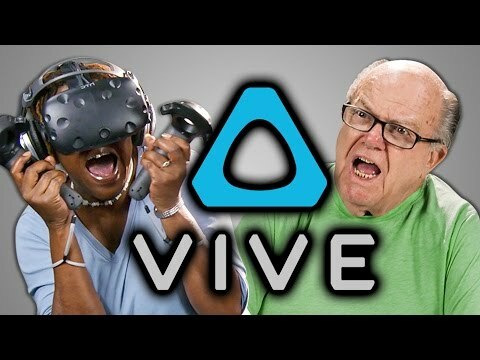 THE MOST DIFFICULT LEVEL VR REACTIONS: Elders trying out HTC Vive. You need to be careful since the very first again. Been watching it more than twice, still laughing—FAILED. P.S. I freaking love Shirley’s reaction. Share your highest score and funniest VR reactions on the comment box below. Can people try not to laugh at it? If you haven’t got your first reaction in virtual reality, you can try out our VR viewer, BeThere Book. Open, snap, and welcome to the virtual world!